North Coast Heavy Vehicle Driver Training offers high quality truck driving lessons to Lismore and the surrounding suburbs. Upgrade your driving skills and learn how to drive heavy vehicles - North Coast instructors will teach you the safest way. Call 0428 66# ### today. 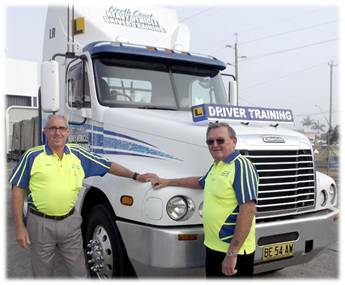 North Coast Heavy Vehicle Driver Training provides personalised driver training in Grafton and surrounding suburbs. It is owned and managed by people who have a background in professional driving stretching more than 38 years now. As a member of the Australian Driver Training Association, the highest standards of quality are met, and they are both fully registered and insured. With its customised lessons for each student’s abilities, the different strategies for operating heavy vehicles are well remembered and applied. A very high success rate is achieved and all driving students gain confidence and competence behind the wheel, regardless of the size and weight of the vehicle. North Coast Heavy Vehicle Driver Training is currently servicing Grafton, Casino, Lismore and nearby areas. Proper truck driver training is extremely important because the heavy vehicles pose greater risks to lives and properties along the road. So before you let someone drive your large truck or van, make sure that the person is well trained in safety and accuracy. Enroll them at North Coast Heavy Vehicle Driver Training today! When you need a professional truck driver instructor, North Coast Heavy Vehicle Driver Training provides a professional approach combined with competitive rates. Sign up for a driving lesson and upgrade your skills, for job opportunities and personal development. All of its driving lessons are conducted by professional, friendly, patient, and understanding people who are certified driving enthusiasts. At this training center, the truck driver lessons are adjusted according to each student’s driving ability. The lessons provided are a combination of both practical and theoretical methods for optimum learning. Need a qualified truck driver instructor? Look no further, because you can find one at North Coast Heavy Vehicle Driver Training. New Trucks are used for all driving lessons, including light models. Appointments are available 24/7, just call 0428 66# ### and ask or Greg - you may also visit their website.